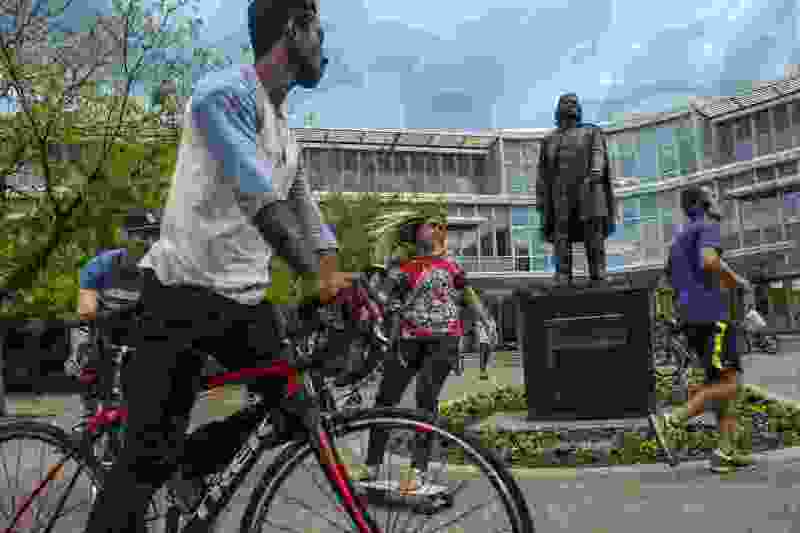 (Chris Detrick | The Salt Lake Tribune) In this file photo, students ride bikes and skateboards around a statue of Brigham Young outside of the Abraham O. Smoot Administration Building at BYU. Brigham Young University’s law school and the dating website Match.com may seem like an unlikely pair. But the two organizations recently partnered up to take a new approach to the law school’s mentoring program by using Match Group’s personality algorithm to pair law students with alumni mentors. It’s a novel approach for BYU, a private university owned by The Church of Jesus Christ of Latter-day Saints, and for Match. A representative for the company, which owns Match.com and Chemistry.com, said this is the first time it has used its algorithm outside the dating world. “There are similarities to dating in the way that a mentor and mentee would need to relate,” said Jared Sine, general counsel for Match and a BYU alum. The mentoring program works somewhat like setting up an online dating profile with Match. Participants answer a series of questions about topics like their interests, their views on life and their perspectives on the world. The students then are sorted into four personality types — builder, director, explorer and negotiator — and paired with an alumni who scored similarly. Gayla Sorenson, the law school’s assistant dean of external relations, said she hopes this innovative approach will help create relationships that benefit not only students learning about the law but also graduates who are now working in the legal field. Sorenson said the school’s mentoring program had fizzled out before. In previous programs, students and mentors had been matched purely by geographical location or the area of law in which someone was interested. “That doesn’t really give you a basis for a friendship necessarily,” Sorenson said. In-person meetups also were encouraged, and participants had required readings. But now, Sorenson said, the school is leaning on technology to give the mentoring program a fresh start. Not only are students and mentors paired with an online algorithm, but also in-person meetups are out and phone or video calls are in. The pairs have been instructed to talk for an hour a month about a specific topic. Sorenson said about 90 percent of first-year law students signed up for the mentorship program, an early signal that the new approach may be successful. The program officially launched in February, and Sorenson said the paired mentors and students are having their first conversations. She’s a part of the mentorship program, too, and was paired with another “explorer” like herself, someone who tends to be enthusiastic about starting new things — but may not always be the best on following through on a project to its conclusion. While it’s too early to tell whether this new approach will yield lasting relationships, Match Group is excited to see how the pilot program works. And Sorenson said is encouraged by the early reviews.